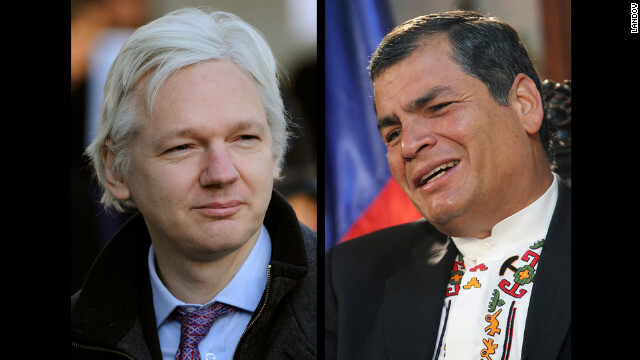 Assange / Correa: Can this be a win-win for both of them? Ecuador is tonight alleging that the UK authorities have threatened to arrest Julian Assange inside its embassy in London. Mr Assange, Wikileaks founder and darling of the far left (and some moderates too) has essentially skipped bail following the rejection of his appeal against extradition to Sweden to stand trial for sexual assault. It is of course part of a bizarre super-story that has been running for two years now, starting with the publication of diplomatic cables between and about governments, the imprisonment and alleged torture of US Marine Bradley Manning, who is accused of leaking the cables in the first place. There is no small irony in the threat from British authorities to cast aside one pillar of diplomacy – the sanctity and sovereignty of the embassy – in order to prosecute the casting aside of another – the leaking of diplomatic cables. Whatever the rights and wrongs of the case, the hypocrisy of international law and international diplomacy is difficult to take. On the one hand, freedom of information, transparency, and open government are the order of the day in domestic politics. The rule of law, due process and the presumption of innocence are staunchly defended in courts at home, but where matters of state security are concerned, such standards seem no longer relevant. Yet the system needs to protect itself. As I commented recently on a discussion on another blog, “…States act and function to power, with a kind of institutionalized survival instinct and protection mechanism, but without any guiding morality and belief.” In the international system, they have historically done so without so much as a fig leaf of propriety. Recently, however, international legal institutions have begun to assert themselves in small ways. There is a system in place, and that most countries see fit to bypass and flout the rules should not deter us from our course. Secrecy it appears can never be avoided. Humans are not machines; opinions can never be definitive, detached from the opinion holder in their analysis. Therefore the diplomatic cables can only have been interpreted in the context of their authors – and their intended recipients. Nuances and deeper meaning will have been lost on most of those exposed to the raw data, resulting in a loss of meaning, a de facto misinformation, irrespective of the good intentions of the leaker. This applies in domestic as well as international politics, and therefore we may be stuck with it. As for sovereignty, it’s been under attack for some time now. We can go way back, but let’s start at Panama in 1989. After unilaterally invading the country, kidnapping its president Manuel Noriega, George H W Bush had the temerity a mere 24 months later to accuse Saddam Hussein of a breach of international law in his unilateral invasion of Kuwait. Since then, we have seen operations in Afghanistan, Iraq (again), and Libya, all of which were contrary to International Law. There are arguments for and against – some International Law supported the War in Afghanistan, though the extent to which Afghanistan constituted a contiguous, coherent state was arguable in the first place. Iraq was famously devoid of legitimate support. All of these interventions eroded the principle of sovereignty. The extent to which more and more States have been willing to intervene in the internal affairs of others risks seriously undermining the international system. Henry Kissinger made the point in a Washington Post article earlier this year, cautioning against intervention in Syria. But there are already covert operations on the ground in Syria, just as there were in Tunisia, Libya, and Egypt while their revolutions progressed. Borders mean little these days. These incidents come around to bite you. The British have struggled for friends in the recent past, not least in its battle with the IRA in Ireland, and against Argentina and the Malvinas / Falklands. They are canny operators in the world of International Diplomacy, and so they will not have compromised a relationship with a country like Ecuador – seemingly so small, and far away, and irrelevant – unless it was for some very high stakes indeed. So one wonders where the pressures are coming from? Ecuadorean president Rafael Correa too is a sharp operator, and has had significant successes in recent times in reducing Ecuador’s debt and asserting the country’s independence and sovereignty. Whatever about the debt, this may be the most significant test yet of Ecuadorean sovereignty. Update: It appears that Ecuador had offered to have Assange in Stockholm as soon as tomorrow should the Swedish government have guaranteed that he would not be extradited to the US. This of course begs the question why would they want to extradite Assange to the US for an alleged sexual assault in Sweden? The UK ruling, as I understand it, was that Assange would be extradited to face trial in Sweden exclusively for the sexual assault charge. It ignored all other considerations as irrelevant. Would the UK authorities have made the same decision having regard to the UN ruling that Bradley Manning had been subjected to inhumane and cruel treatment? Surely they would have to have taken a view that should Assange been subject to extradition to the US, he too would have been at risk of suffering similar mistreatment? the only way a state can be ‘legitimate’ is when the individuals who make up the state are ‘legitimate’ – the question then becomes what is ‘legitimate’ or lawful? what is licence?